So I went with "Plan B"....no wait, that was "Plan C"......uh no, "Plan D".....well, actually I went with "Plan E." I kid you not, my day started out with wanting to ride 100 miles on the bike, but when I woke up, the window of good weather was reduced to where I only felt comfortable going on a 62 mile ride, so I adjusted my route plans in time to see that the afternoon storms were supposed to start even earlier. Now I was thinking about a 50 mile route. Then I looked at the weather and it showed storms starting in less than an hour. Oh well, lots of rain lately, cloudy skies could only mean going out to shoot waterfalls. I quickly altered my plans for the day and grabbed my camera. I loaded up the truck headed for Stone Mountain so I could shoot Widow Creek Falls. As I turned onto Hwy 21, the clouds parted and the sun started to shine. Well, that just won't work at all. 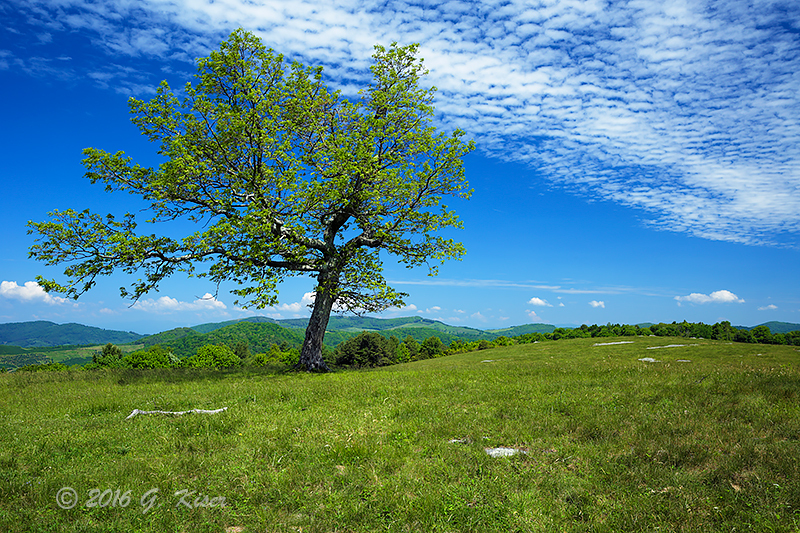 I decided to head out to the Blue Ridge Parkway and see what was going on at Doughton Park to take advantage of the clouds. By the time I got there, most of the clouds were gone, and there had been no rain at all. So much for the weather forecasts...I could have ridden my long route today, or I could have ridden on the Parkway for how nice the day turned out. But....I was here with my camera. I decided to give it a try and see what I could come up with to record in photographs. There were quite a few people in the park, so I had to be rather careful in order to avoid getting anyone in the corners of my pictures, but I didn't have too much trouble for the most part. 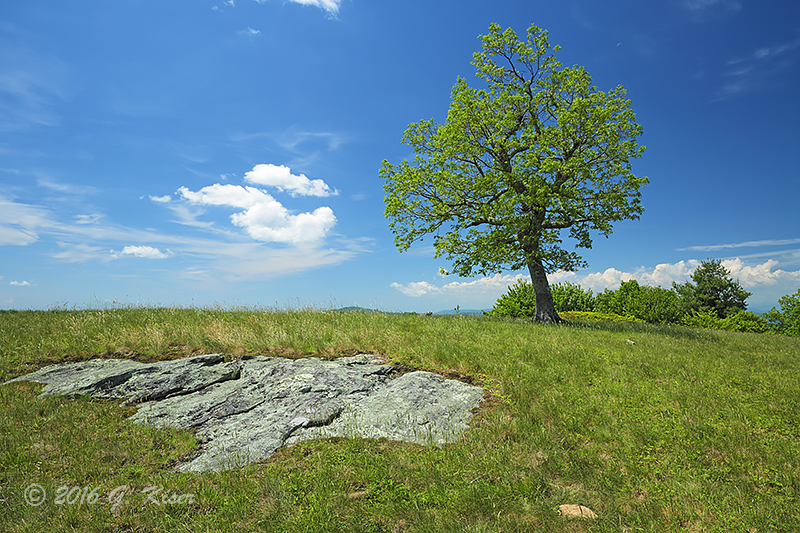 I knew that I wanted to spend some time up on the hill with a lone tree that has always captured my attention over the years. With the sun up pretty high in the sky, I had to be careful with my compositions to avoid deep shadows. Fortunately, the clouds were usually in the section of sky that I needed as a back drop. There was a pretty good little breeze atop the hill. I would have liked to captured a long exposure showing the clouds moving, but that would have blurred the tree too much. I found this composition as a compromise. 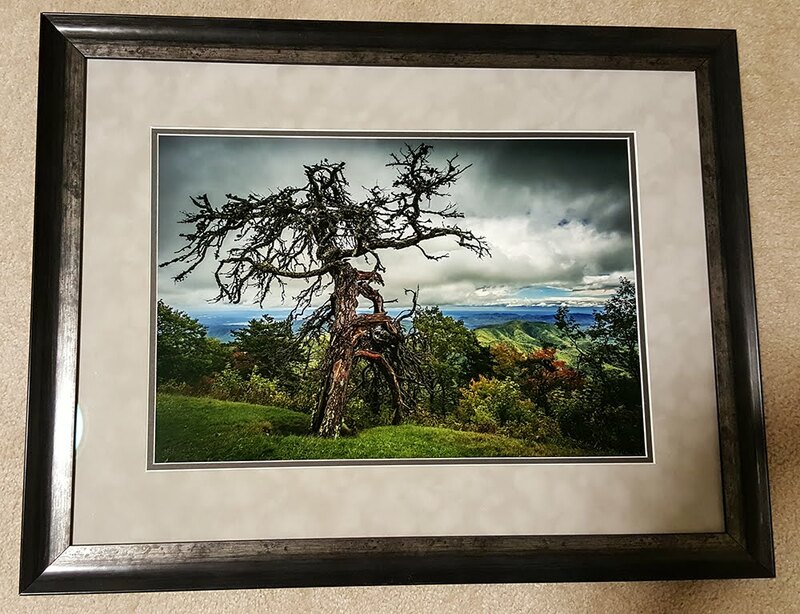 With the converging lines formed by the clouds and the ground leading off to the right, it gives a sense of motion that compliments the tree nicely. While a tack sharp image, there is a sense of movement and excitement in this frame. I tried several other compositions around this tree to no avail. I moved around and looked for other subjects as well, but was unable to find anything suitable. I decided to move towards the other side of the parking lot to see what the main trail had to offer. 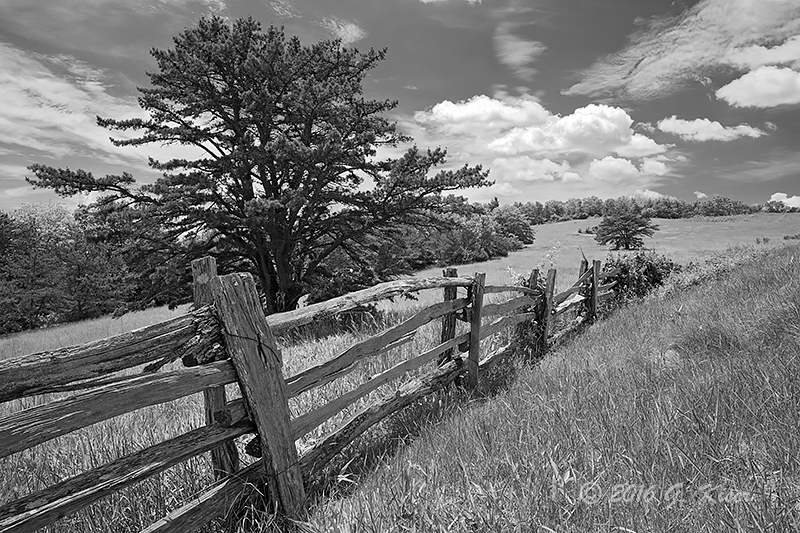 On one of my last trips out here, I had found this fence right behind the parking lot and spent some time photographing it. I decided to give it another try today as well since the clouds were kind of interesting in this direction now. The sun wasn't doing me any favors, but thanks to the exposure latitude of my camera, I was able to record both shadow and highlight details in a single frame without the need for an HDR attempt. 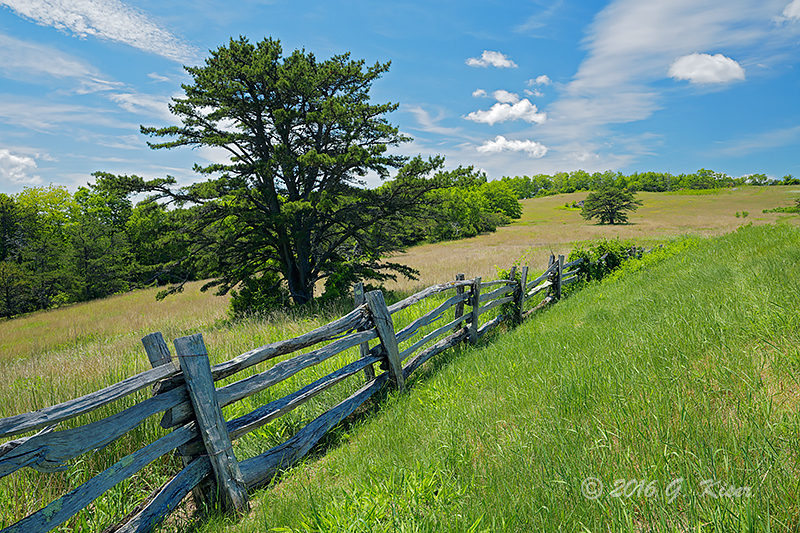 With the receding trees and the leading fence, there is a nice pull to this picture, and the slight hill on the right helps give a nice visual balance to the image. While editing through this set of pictures, I started really thinking about doing this in a monochrome conversion. I found another one with a little more drama to the sky to do the conversion to. This one is a bit more tightly cropped, and the clouds are a bit more emphasized. The exposure on this one also lends itself more for the B&W touch. With just a little bit of tweaking on the contrast, I had an image I was relatively happy with. I'm always looking for those images that can make for a successful conversion, mainly because Toni has always preferred the B&W images and I like to make her happy. This was the only one from today's shoot that made a good mono shot though, the rest looked much better in full color. 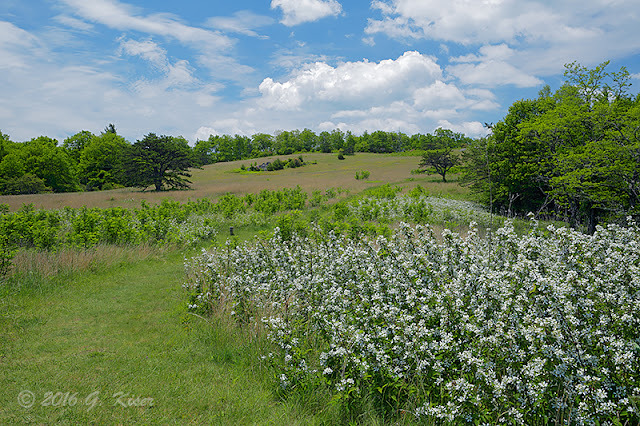 When I made it over to the other side of the parking lot, I was met with a field of wild flowers. I was wishing that they were a different color than white, but they did a nice job at breaking up the green of the grass, and happened to frame the trail which helped to form a leading line into the picture. I was really liking the sky here, and had to make use of my ND Grad filters to help control the contrast due to the sun's position in the sky. It turned out OK in the end, but I was really worried that it was going to be a failure when I was clicking the button. From here, I moved on down the trail and did something that I don't normally do. I utilized a man made trail marker as an element in a photograph. usually, I try to avoid these in my pictures, but for some reason, today, it made sense to add it in. I left my ND Grad attached and got in really tight with it, using a fairly wide angle focal length, and really made the marker an important part of the photograph. As you can see, they have painted the arrow yellow, which makes it stand out, and it is quite literally pointing you down the trail, and leading your eyes in the same direction. It isn't a normal composition for me by any stretch, but I really think that it works in this situation. I'm happy that I spent the time to get this one to work out so well. 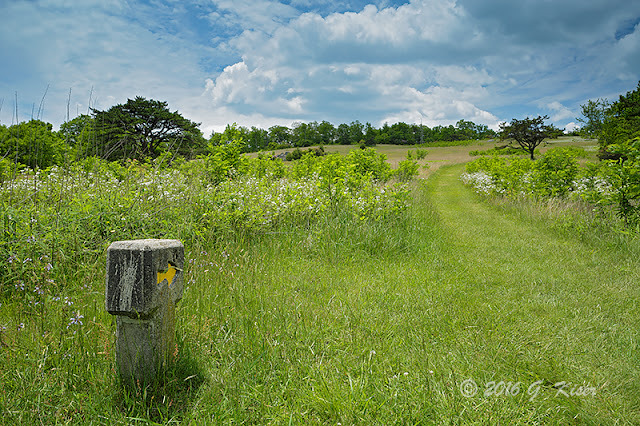 When I was done, I continued on down the trail...hey, the marker told me to! I started looking at several trees that I have photographed in the past, but the lighting wasn't right for them today, so I had to keep looking. 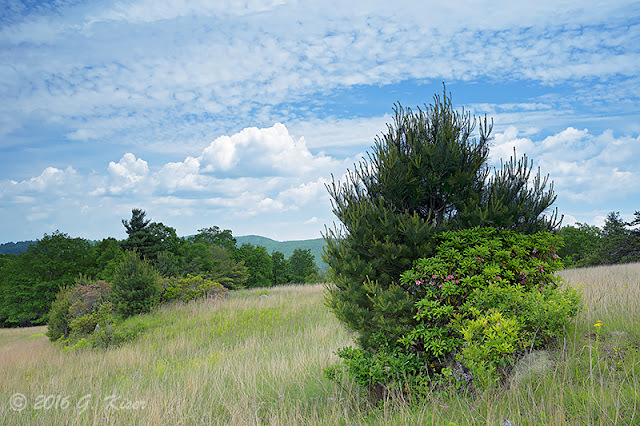 I did find one tree that I have never photographed before because of the light, that actually looked pretty good today, especially with the clouds behind it. I worked for a while to figure out the best composition, and focal length to use, and I think I found the winning combination. The hint of pink provides just enough color, and helps to link to the island of vegetation to the left of the frame. The texture in the sky provides a bit of relaxation which completes the composition. It is not an "in your face" kind of shot, but it does set a nice mood I think. That was kind of the theme for the day actually. It was all about getting away and finding a bit of relaxation. Even though I didn't get to ride my bike, I did find some meditation time doing something that I enjoy. That makes it a win of a day in my book.